Rita Baragona was born in New York in 1945. She received a BFA from Carnegie Mellon University in 1967, and attended the New York Studio School from 1968 to 1970. From 1979 - 2015, she has had fifteen one-person exhibitions at the Bowery Gallery in New York. Other selected one-person shows have been at Rider University, Fairleigh Dickinson University, Washington Art Association, and the Dutot Museum. Selected group shows include, in NYC, Lori Bookstein Gallery, Kouros Gallery, Borgenicht Gallery, Midtown Payson Gallery, Painting Center, Lohin-Geduld Gallery, and the New York Studio School; and across the USA , the Noyes Museum, NJ, Well Street Gallery, AK, Lyme Academy, CT, Tallahassee Gallery, FL, Bryn Mawr College, PA, and Allentown Museum, PA. As a member of Zeuxis, she has shown in various venues across the US. A select few include Southwestern Illinois College, IL, Anderson University, IN; The Painting Center, NYC; Lancaster Museum of Art, PA; and MICA, MD. Baragona taught painting and drawing at Blair Academy in Blairstown, NJ for 24 years, serving for part of that time as department chair. 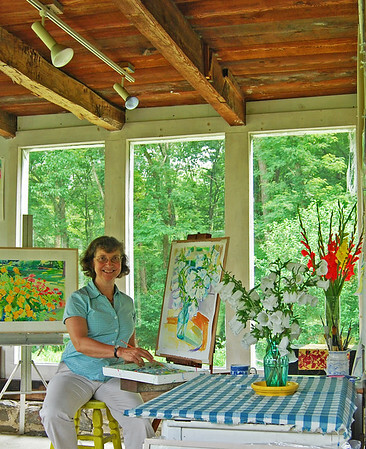 On several occasions she was an adjunct professor at Rider University, Lawrenceville, NJ, and arts festival painting instructor, Fairbanks, AK, as well as teaching private classes. Residencies include the Fairbanks Summer Arts Festival, the Dorland Mountain Arts Colony, California, and the Vermont Studio Center. Her work is reproduced in T. Sullivan, The Best of Drawing and mentioned in Jed Perl, Gallery Going. Baragona has been positively reviewed in art journals and newspapers including Examiner.com, Art in America, the New Criterion, Art and Antiques, The New Republic, Arts, and Packet.